This article is about the expressway system of the People's Republic of China. For the highway system of the Republic of China (Taiwan), see Highway system in Taiwan. For the regular highway system of the People's Republic of China, see China National Highways. The expressway network of China, with the national-level expressway system officially known as the National Trunk Highway System (Chinese: 中国国家干线公路系统; pinyin: Zhōngguó Guójiā Gànxiàn Gōnglù Xìtǒng; abbreviated as NTHS), is an integrated system of national and provincial-level expressways in China. By the end of 2018, the total length of China's expressway network reached 142,500 kilometers, the world's largest expressway system by length, having surpassed the overall length of the American Interstate Highway System in 2011. Many of the major expressways parallel routes of the older China National Highways. On September 3, 1998, Huabei Expressway Co., Ltd., Northeast Expressway Co., Ltd., Hunan Changyong Expressway Co., Ltd., and Guangxi Wuzhou Transportation Co., Ltd. were approved by the government as the first batch of nationally issued stock companies that would develop, construct, and operate expressways in China. In June 2013, the Ministry of Transport introduced the National Highway Network Planning, covering both the national highway system and the national expressway system from 2013 to 2030. Goals include making traffic travel more convenient and developing a variety of regions, as well as more focus to the highways and expressways of the western regions of China. According to this plan, the total size of the national road network will reach 400,000 kilometers, including 265,000 kilometers of common national highways and about 118,000 kilometers of expressways. In addition, the 7918 network would be renamed the 71118 network when the number of north-south expressways were increased from 9 to 11. Huang Min, director of the Basic Industry Department of the Development and Reform Commission, said that whether the plan is for ordinary national roads, the development of expressways is prioritized more in the western regions. According to Huang, the two expressways were to be added to the western region, while none in the northern, eastern, or southern regions. In 2014, Wang Tai, deputy director of the Highway Bureau of the Ministry of Transport, introduced the national toll highway mileage and mainline toll stations. Efforts are made to improve the efficiency of transportation, so that the freeway and other modes of transport can be seamlessly connected or transferred and the overall transportation efficiency can be improved. Neither officially named "motorway" nor "highway", China used to call these roads "freeways". In this sense, the word "free" means that the traffic is free-flowing; that is, cross traffic is grade separated and the traffic on the freeway is not impeded by traffic control devices like traffic lights and stop signs. Some time in the 1990s, "expressways" became the standardised term. Note that "highways" refers to China National Highways, which are not expressways at all. "Express routes" exist too; they are akin to expressways but are mainly inside cities. The "express route" name is a derivation of the Chinese name kuaisu gonglu (compare with expressway, gaosu gonglu). Officially, "expressway" is used for both expressways and express routes, which is also the standard used here. The names of the individual expressways are regularly composed of two characters representing start and end of expressway, e.g. "Jingcheng" expressway is the expressway between "Jing" (meaning Beijing) and Chengde. The Road Traffic Safety Law of the People's Republic of China stipulates the speed limit of 120 km/h (75 mph), effective since May 1, 2004. A minimum speed limit of 70 km/h is in force. On overtaking lanes, however, this could be as high as 100 km/h to 110 km/h. Penalties for driving both below and in excess of the prescribed speed limits are enforced. Some expressways have a lower design speed of 80 kilometres per hour (50 mph). Only motor vehicles are allowed to enter expressways. As of May 1, 2004, "new drivers" (i.e., those with a Chinese driver's licence for less than a year) are allowed on expressways, something that was prohibited from the mid-1990s. Overtaking on the right, speeding, and illegal use of the emergency be,t (or hard shoulder) cost violators stiff penalties. Expressways in China are signed in both Simplified Chinese and English (except for parts of the Jingshi Expressway, which relies only on Chinese characters, and some provinces, in Inner Mongolia for example signs are in Mongolian and Chinese, and in XUAR the signs are in Chinese and Uyghur Language which uses Perso-Arabic Alphabet). This sharply reduces the language barrier; however, very few toll officials at toll gates speak English. The signs on Chinese expressways use white lettering on a green background, like Japanese highways, Swiss autobahns and United States freeways. Newer signage places the exit number in an exit tab to the upper right of the sign, making them very similar in appearance to American freeway signs. Exits are well indicated, with signs far ahead of exits. There are frequent signs that announce the next three exits. At each exit, there is a sign with the distance to the next exit. Exit signs are also posted 3000 m, 2000 m, 1000 m, and 500 m ahead of the exit, immediately before the exit, and at the exit itself. Service areas and refreshment areas are standard on some of the older, more established expressways, and are expanding in number. Gas stations are frequent. Signs indicate exits, toll gates, service/refreshment areas, intersections, and also warn about keeping a fair distance apart. "Distance checks" are commonplace; the idea here is to keep the two-second rule (or, as Chinese law requires, at least a 100 m distance between cars). Speed checks and speed traps are often signposted (in fact, on the Jingshen Expressway in the Beijing section, even the cameras have a warning sign above them), but some may just be scarecrow signs. Signs urging drivers to slow down, warning about hilly terrain, banning driving in emergency lanes, or about different road surfaces are also present. Also appearing from time to time are signs signaling the overtaking lane (which legally should only be used to pass other cars). Although most English signs are comprehensible, occasionally the English is garbled. Many expressways have digital displays. These displays may advise against speeding, indicate upcoming road construction, warn of traffic jams, or alert drivers to rain. Recommended detours are also signaled. The great majority of messages are only in Chinese. Exit numbering has been standardised in China from its inception. Most Chinese expressways, especially those in the national network, use distance-based exit numbering, with the last three numbers before the decimal point taken used as the exit number. Hence, an exit present at km 982.7 would be Exit 982, whereas an exit at km 3,121.2 would be Exit 121. Unlike American exit numbering systems that reset at each state line a freeway crosses, exits on Chinese expressways increase along the total length of the freeway, regardless of how many provincial boundaries the expressway crosses. Mostly regional expressways still use sequential exit numbering, although even here, new signage feature distance-based exit numbering. Before the 2009–2010 numbering switchover, nearly all of China's expressways used sequential numbering, and a few expressways used Chinese names outright. The exit is written inside an oval in green letters to the immediate right of the Chinese word for exit, "出口" (chukou). The total costs of the national expressway network are estimated to be 2 trillion yuan (some 300 billion US dollars as rate in 2016). From 2005 to 2010, the annual investment was planned to run from 140 billion yuan (17 billion US dollars) to 150 billion yuan (18 billion US dollars), while from 2010 to 2020, the annual investment planned is to be around 100 billion yuan (12 billion US dollars). The construction fund will come from vehicle purchase tax, fees and taxes collected by local governments, state bonds, domestic investment and foreign investment. Unlike other freeway systems, almost all of the roads on the NTHS/"7918 Network" are toll roads that are largely financed by private companies under contract from provincial governments. The private companies raise money through bond and stock offerings and recover money through tolls. Examples of these companies include Huabei Expressway Co., Ltd., Northeast Expressway Co., Ltd., Hunan Changyong Expressway Co., Ltd., and Guangxi Wuzhou Transportation Co., Ltd.
Efforts to impose a national gasoline tax to finance construction of the tollways met with opposition and it has been very difficult for both the Communist Party of China and the State Council to pass such a tax through the National People's Congress of China. China has an extensive tollway system, which composed of nearly all expressways as well as having around 70% of the world's tollways. Tolls are roughly around CNY 0.5 per kilometre, and minimum rates (e.g. CNY 5) usually apply regardless of distance. However, some are more expensive (the Jinji Expressway costs around CNY 0.66 per kilometre) and some are less expensive (the Jingshi Expressway in Beijing costs around CNY 0.33 per kilometre). It is noteworthy that cheaper expressways do not necessarily mean poorer roads or a greater risk of traffic congestion. Expressway planning is performed by the Ministry of Transport of the People's Republic of China. Unlike the road networks in most nations, most Chinese expressways are not directly owned by the state, but rather are owned by for-profit corporations (which have varying amounts of public and private ownership) which borrow money from banks or securities markets based on revenue from projected tollways. Examples of these corporations include Huabei Expressway Co., Ltd., Northeast Expressway Co., Ltd., Hunan Changyong Expressway Co., Ltd., and Guangxi Wuzhou Transportation Co., Ltd. One reason for this is that Chinese provinces, which are responsible for road building, have extremely limited powers to tax and even fewer powers to borrow. Expressway construction has also been one of the rare instances in which the Communist Party of China and the State Council has had to back down on a major policy initiative. Since the late-1990s, there were proposals to fund public highways by means of a fuel tax, but this was voted down by the National People's Congress. China's tollways were criticized for having excessively high toll fees. According to Zhongxin.com, by reducing toll fees, it will lead to logistic costs reductions, another problem encountered by the country's expressway system. Reforms of the tollway system were planned by the National People's Congress with the inclusion of cost reduction of bridges. Most expressways use a card system. Upon entrance to an expressway (or to a toll portion of the expressway), an entry card is handed over to the driver. The tolls to be paid are determined from the distance traveled when the driver hands the entry card back to the exit toll gate upon leaving the expressway. A small number of expressways do not use a card system but charge unitary fares. Passage through these expressways is relatively faster but it is economically less advantageous. An example of such an expressway would be the Jingtong Expressway. China is increasingly deploying a network of electronic toll collection (ETC) systems, and in the latest edition of expressway toll gate signage, a new ETC sign is now shown at an increasing number of toll gates. ETC networks based around Beijing, Shanghai, and Guangdong province all feature either mixed toll passages supporting toll card payment or full-service dedicated ETC lanes. Beijing, in particular, has a dedicated ETC lane at almost all toll gates. City transit cards are not widely used; one of the first experiments with the Beijing Yikatong Card on what is now the Jingzang Expressway (G6) went live for only a year before a new national standard replaced it in early 2008. A previous system, the 1992 "five vertical + seven horizontal expressways" system, was used for arterial expressways and were, in essence, G0-series expressways (e.g. G020, G025). This was replaced by the present-day new numeric system (see below). A new system, which dates from 2004 and began use on a nationwide level between late 2009 and early 2010, integrates itself into the present-day G-series number system. The present-day network announced in 2017, termed the 7, 11, 18 Network (also known as the National Trunk Highway System, NTHS), uses one, two or four digits in the G-series numbering system, leaving three-figured G roads as the China National Highways. The network is additionally composed of connection expressways as well as regional and metropolitan ring expressways. On a nationwide basis, expressways use the G prefix (short for "guojia" in Chinese meaning "national"), as well as the character "国家高速" (National Expressway, white letters on a red stripe on top of the sign). 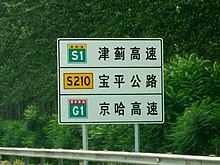 For regional expressways, the prefix S (short for "shengji" or "provincial") is used instead, as well as the one-character abbreviation of the province and "高速" (expressway, black letters on an orange-yellow stripe on top of the sign.) The same numbering system is used for both national and regional expressways. All expressways have a thin band on top of the sign. For national expressways, it will be red; for regional ones, it will be orange-yellow. For radial expressways leaving from or ending in Beijing, use a single digit from 1 to 9 (e.g. G1, G2). For north-south expressways, use an odd number from 11 to 89 (e.g. G11, G35). For west-east expressways, use an even number from 10 to 90 (e.g. G20, G36). Note: G99 or the Taiwan Ring Expressway is currently a theoretical expressway based in Taiwan Province, which is claimed by the People's Republic of China, but is actually administered by the Republic of China. (In addition, the ROC has not built the eastern half as an expressway.) See Political status of Taiwan. See also Highway System in Taiwan for the current Republic of China-maintained Taiwan freeway system, which uses a different numbering system. For city ring expressways, use "0" plus an order number after the main line number, starting from the smallest possible number (e.g. G5001). For connection expressways, use an odd numeral plus an order number after the main line (e.g. G9411). For the parallel expressways running alongside primary ones, use an even numeral (except "0") plus an order number after the main line (e.g. G0422, here the corresponding main line with a single digit should follow a "0" to be distinguished with CNH). ^ The Shanghai–Jiading Expressway was the first expressway to be built in Mainland China, excluding Taiwan (see Political status of Taiwan), as well as Hong Kong and Macau, which were under British and Portuguese control respectively at the time. If Taiwan is included, the first expressway to open in modern China was Taiwan's National Highway 1, known as the Zhongshan Expressway, which opened in 1974. ^ Length of network as of 1 January of the respective year. ^ a b c d Li, Si-ming and Shum, Yi-man. Impacts of the National Trunk Highway System on accessibility in China Archived 22 June 2010 at the Wayback Machine. Journal of Transport Geography. ^ a b chinanews. "未来公路建设向西部倾斜 有助改变区域经济发展-中新网". www.chinanews.com. Retrieved 29 April 2018. ^ National Bureau of Statistics of China Archived 2009-03-07 at the Wayback Machine. ^ "交通运输行业晒出2016年度成绩单". Gov.cn. 17 April 2017. Archived from the original on 27 April 2017. Retrieved 16 June 2017. ^ "USATODAY.com - China's highways go the distance". usatoday30.usatoday.com. Retrieved 29 April 2018. ^ a b c "Huabei Expressway Co., Ltd.: Private Company Information - Bloomberg". www.bloomberg.com. Retrieved 29 April 2018. ^ a b c "Northeast Expressway Co. Ltd.: Private Company Information - Bloomberg". www.bloomberg.com. Retrieved 29 April 2018. ^ a b c "Guangxi Wuzhou Transportation Construction Development Co Ltd: Company Profile". Bloomberg. Retrieved 29 April 2018. ^ chinanews. "全国收费公路里程达16.26万公里 共有收费站1665个-中新网". www.chinanews.com. Retrieved 29 April 2018. ^ "我国高速路年底或超12万公里". Retrieved 29 April 2018. ^ a b "China bites the bullet on fuel tax". Rsc.org. 1 January 2009. Retrieved 17 December 2015. ^ a b "BBC News". BBC News. Retrieved 17 December 2015. ^ a b "高速公路还完贷款不应再收费--中国高速公路网". www.china-highway.com. Retrieved 9 May 2018. ^ 网易. "中国物流费用占GDP达16% 多地实施高速公路降费_网易新闻". news.163.com. Retrieved 9 May 2018. ^ "李克强：深化收费公路制度改革 降低过路过桥费用_中国公路网". www.chinahighway.com. Retrieved 9 May 2018. ^ "明年起使用ETC卡交纳通行费不再开纸质发票_中国公路网". www.chinahighway.com. Retrieved 9 May 2018. ^ "365条ETC车道开通，基本实现全市收费站点全覆盖". 北京快通高速路电子收费系统有限公司. 29 April 2010. Retrieved 3 August 2010. ^ "北京八达岭高速"速通卡"将停止使用". 京华时报. 3 January 2008. Retrieved 3 August 2010. Wikimedia Commons has media related to Expressways in China. This page was last edited on 18 April 2019, at 03:12 (UTC).